NORTH LITTLE ROCK, Ark. (KTHV) -- Development and progress can come in many shapes and sizes. 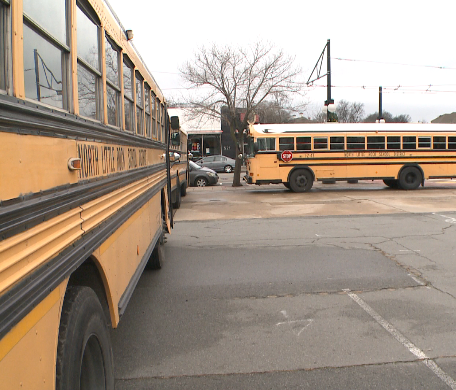 On Monday it came in the form of school buses in North Little Rock. The city is using ten of them to outline its plans for a new plaza it plans on building at the intersection of Main and 6th Street. It would be an outdoor square with dining, fountains and possible apartments. Mayor Joe Smith got the idea when he went on a mayoral retreat, now he hopes it adds on a growing North Little Rock. Smith says a big inspiration was Sundance Square in Fort Worth. With its fountains and murals he says it sets the perfect tone for the Argenta region. “The arena and the ballpark are the tenant acres downtown if you will and now it's time to do the filling,” Smith said. The plan has been in the works for a few years and local businesses are as excited as Smith. 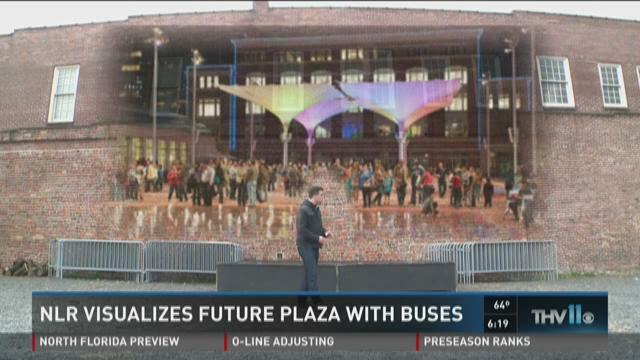 “There's plenty of room [for the plaza] and the mayor just said these telephone poles will come down,” said Bruce Engstrom pointing to telephone poles in the plaza’s zone. Engstrom is commissioner of the Argenta improvement district. He also owns a financial analytics business next door. “You know when I just started my business people asked me why I had my business down here. Now they don't ask that anymore,” he said laughing. Much like the mayor he agrees-- it's a bright idea-- that's sure to bring a nice vibe to the region. “This is for all of North Little Rock and really all of Central Arkansas,” Smith said. Smith says he hopes to fund the project through philanthropic donors and other sources.